Thanks so much for stopping by today for a brief chat about caregiving and care receiving. Pour a cup of coffee or hot tea, find a comfy chair, and take a deep breath. It’s time for a little break in the action. With the advent of Daylight Savings Time last weekend, no doubt we are all feeling the effects of losing an hour in the day. Since the same amount of work remains to be done, we typically lose an hour of sleep when forced to Spring Forward. So, be gentle with yourself this week as you adjust to the time change. Although I am reluctant to sacrifice an hour of sleep, I welcome this time of year with open arms and an open heart. Springing Forward heralds the coming of Spring—the season of renewal, growth, birth, and hope. Look around—there are signs of new life all around! Having endured the cold, stark season of winter, we long to see, to hear, and to feel the evidence that the cycle of life continues. Trees budding. Grass greening. Birds chirping. Bulbs blooming. Sun warming. The world is slowly awakening from a winter’s slumber and coming back to LIFE! What an EXTRAordinary time of year. This year as witness to the routine—yet sacred—seasonal transition, I savor the signs of Spring with an enhanced appreciation and fervor. My heightened sense of awareness comes at a very high price. Recently I learned that a beloved family member is terminally ill and was admitted into hospice care this weekend. If you have cared for a loved one with a progressive and/or terminal illness, perhaps you reacted in a similar manner. Knowing that time is short, life becomes priceless! Every moment is precious—an opportunity to embrace and to revel in the mystery of life. As I witness the tragic demise of my loved one, I am painfully aware of the fleeting nature of life. Furthermore, I must decide if this turn of events will diminish or enrich my life. I must choose how the death of my loved one will inform the remainder of my journey. Although distressing in many ways, being reminded that life is a gift without guarantees will ultimately serve me well—again. I felt this way after the death of my mother, my father, and some dear friends. However, it takes a concerted effort to grieve and mourn each loss before embracing the expanding life lessons. Today—to be honest—I am hurting, searching, questioning, and raging. That is why I desperately need the signs of hope that are springing up all around. 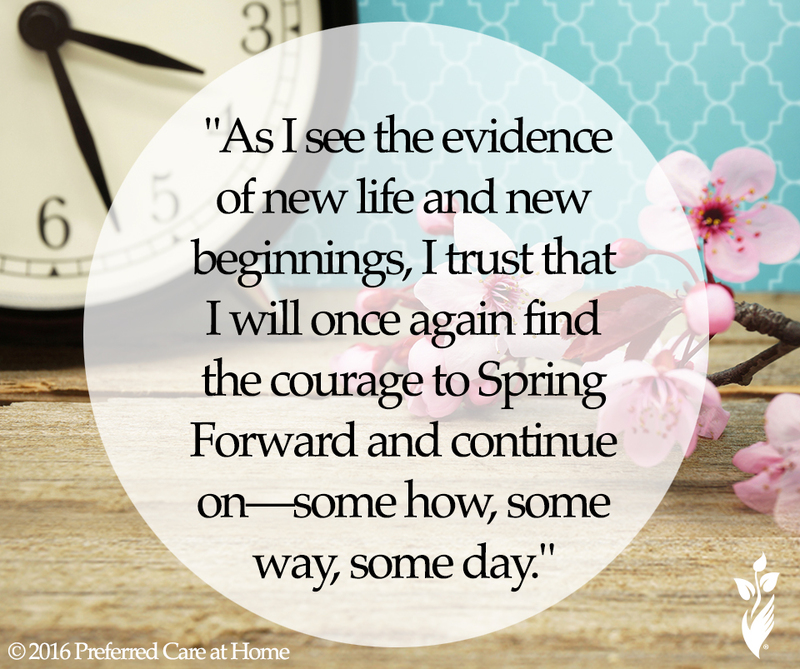 As I see the evidence of new life and new beginnings, I trust that I will once again find the courage to Spring Forward and continue on—some how, some way, some day. The path will unfold as I am able and willing to proceed. Today, if you are walking a similar path, seek the signs of life that serve to inspire, sustain, and comfort you…one step at a time.